I’ll be honest. This is by far the hardest topic I’ve written about on this blog yet. I always knew there would be a time to talk about it, but honestly, when you’re in the middle of a struggle or trial, writing about it and sharing about it with the world is the last thing you want to do. Yet, here I am. About to spill my guts about what it’s like to parent alongside a chef. It’s not easy. Parenting is a trillion times harder than I EVER thought it would be. It’s very rewarding and I love being a Mom. But WOW! It’s not easy! Will you help me reach more chef families by pinning, sharing or tweeting this post? Thanks for your help! I decided to do a video series on this topic as I felt like I could get my thoughts across better using that medium. So for the next few weeks, make sure to check back every Tuesday for the next post in the series. For those of you with children, what is your biggest struggle in raising a family with a chef? And for those of you who would like to have children in the future, what scares you the most? Let me know in the comments below. 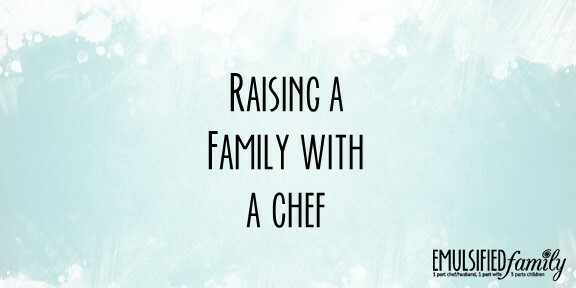 You can read the rest of the posts in this series, Raising a Family with a Chef, here. Follow Jennifer @ Emulsified Family’s board Having children with a chef on Pinterest.